It is difficult to keep up with Microsoft. If you administrate Windows server or client systems or are responsible for maintaining PCs in a home network or even individual PCs of friends or family, you already have a lot to do when it comes to keeping them up to date. Sure, you can keep automatic updates enabled and hope for the best. Microsoft's past performance in this regard has made this less practicable as you will run into issues eventually. Microsoft maintains a huge Knowledge Base (KB) with support articles. All updates for Windows are documented on KB pages, and there are plenty of non-update related KB pages that Microsoft publishes or updates. Up until now, there was no easy way of finding out which KB pages Microsoft published or updated on a given day. Microsoft maintains a list probably, but it is not publicly accessible. AskWoody contributor MrBrian created an ingenious solution and released it as a Microsoft Excel macro. Woody Leonhard created an online solution for it and named it KBnew. KBnew lists updated English KB support articles in chronological order. You can still download the Excel macro and use it on your system, but the online listing is more accessible in my opinion. The current version of KBnew uses s simple layout. 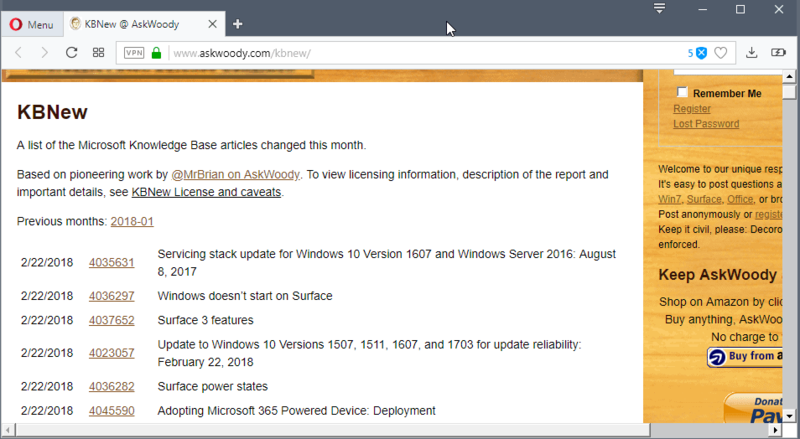 It lists the date, the KB ID, and the title of the article for each updated or newly released support article. IDs link to the support articles which is very convenient. The Excel script pulls data from Microsoft sitemaps to identify new or updated KB articles on Microsoft's website. It appears to work well but may require adjustments over time when new sitemaps get added to the mix. Microsoft maintains a huge list of sitemaps on its support subdomain. The index lists sitemaps for all supported languages, and is difficult to navigate through. Admins who require the information for another language may adjust the Excel macro for that. It should not be too difficult to do so considering that the sitemaps follow the same syntax. KBnew is a super helpful listing of updated or newly released Microsoft KB articles. It is helpful mostly for system administrators who want to stay in the loop, as it is not really possible otherwise when it comes to KB articles. Now you: Do you work with KB articles regularly? KBnew is an Excel macro and online service that lists all updated or newly released Microsoft Knowledgebase (KB) articles in chronological order. This list is a must for everyone who likes to keep an eye on what gets installed on PC. However the site does not load. I use WSUS Offline Updater, but not until i know it is safe to update…. The online version lacks a means of searching for a given update. A means of separating the data into OS types i.e. Windows 7, Windows 8.1 etc., would be useful too. i will make this short and sweet these clowns Chronological belong in the garbage can. Linux is not windows and should not in my opinion even allow windows to squeeze their way in, ubuntu absolute garbage the spyware of linux. We use linux to be free of this sort of junk and to allow a semi merger between the windows world and linux come on we are better than that. No offense meant but this is how i see it.